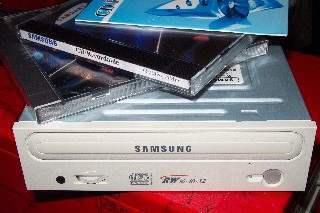 Last time we took a look at the Samsung 8X4X32 DVD/CDRW combo drive. Since then, they have released another unit this time with just the cd burning functionality. While there are other models available from about 20 different companies, Samsung has gone ahead and produced a 16X burner that is very affordable and reliable. 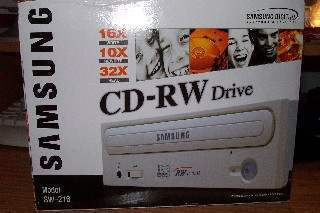 We will be taking a look at the Samsung SW216 CDRW, which is nicely priced at less than $100 USD. One of the nice additions to the package is the addition of Ahead Nero 5.5. They used to pack EZ CD Creator in their other offerings, but I find Nero a lot easier to use. If you are using Windows XP, Nero 5.5 functions perfectly. Another reason they offered Nero was because of the use of Just Link and Just Speed. You may have heard of 'Burn Proof' in drives from Plextor and Lite-On. What this does is prevent buffer under-runs from happening. 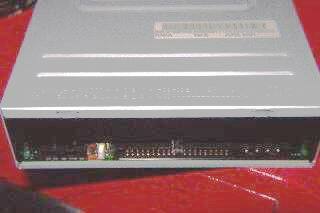 Just Link is the equivalent to Burn Proof, it stops the burn process when a buffer under run occurs (this usually happens when data is not fed fast enough to the burner), waits for the buffer to fill up again and continues to burn the cd afterwards. All this to prevent you from burning a coaster. Just Speed lets the burner burn at the max speed of the burner, without regards to the actual speed of the media. This can all be turned off or on, and its fully supported within Nero. Also note, there is a newer BIOS that allows the drive to burn DAO RAW. You can grab the download here from Samsung, they call the BIOS 'powerful'. There is a single LED that shows whether the drive is active or not. The same LED also illuminates the eject button, which is large and easy to press. I've been through about three (3) burners so far, and this larger sized button is one of the better designs. Ever press a small button with large fingers? It's harder than you think! You have the basic digital audio connectors, jumpers, IDE port and 4 pin molex for the power on the back. All labeled on the metal casing so you know where they are.